This is a Brian Tracy book (audio book) that I received from my cousin at Christmas time (thank you cousin). After listening to the audio book in my car, I realized that I was not doing the exercises at the end of each chapter because I did not stop and write the exercises down to do at a later time when I was not driving. So, I also purchased the book in hardcover so I could have the exercises written down for me to do. Like all the audio books I have, I have listened to this one multiple times. I addition to having my listening interrupted by arriving at my destination, there are times when I miss something on the audio because of those moments when driving has to take priority in the moment. I find that listening to the book multiple times makes sure I heard everything. 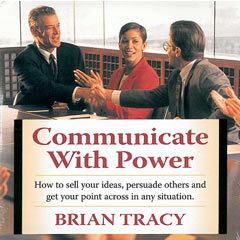 Like most Brian Tracy books, this book has a lot of the same concepts as his other books. In each chapter he contrasts two types of thinking and goes over the advantages and disadvantages of each. At the end of each chapter are action steps and questions to answer for yourself to help implement the ideas into your life. I am glad I brought this book and recommend you get a copy for yourself. First, I want to say I have been enjoying Brian Tracy products for many years. I have many of his audios and some of his other products such as his Goals! book. That being said, my most recent purchase and listen is “Communicate with Power.” This hour long audio has many familiar points and stories in it. The new story in this audio for me was about Bill Gates. It wasn’t just that Bill Gates and his partners wrote the MS-DOS/PC-DOS operating system, it was that Bill and company used communication and persuasion to convince IBM they were the right people to write the operating system when they had no operating system. To get your own copy, click on the image.